You may be wondering what the heck this guy is talking about. Well, since you asked, I decided to continue my gardening through the winter by growing some green manure. Green manure? What are you doing with that crap? Well, technically green manure isn’t “crap”. It is a cover crop that establishes itself in the Fall , overwinters, and will continue to grow through the Spring if you let it. For my garden beds, I chose Winter Rye. What are the advantages to a cover crop? To start, I planted the rye in October. This being my first time planting my seed, I wasn’t sure what to expect. Everything was so dirty- my boots, my gloves, the rake… Note I’m sowing winter rye, not sowing my wild oats, so we’ll keep the commentary from getting too out of hand. Sprouts are starting to turn green. 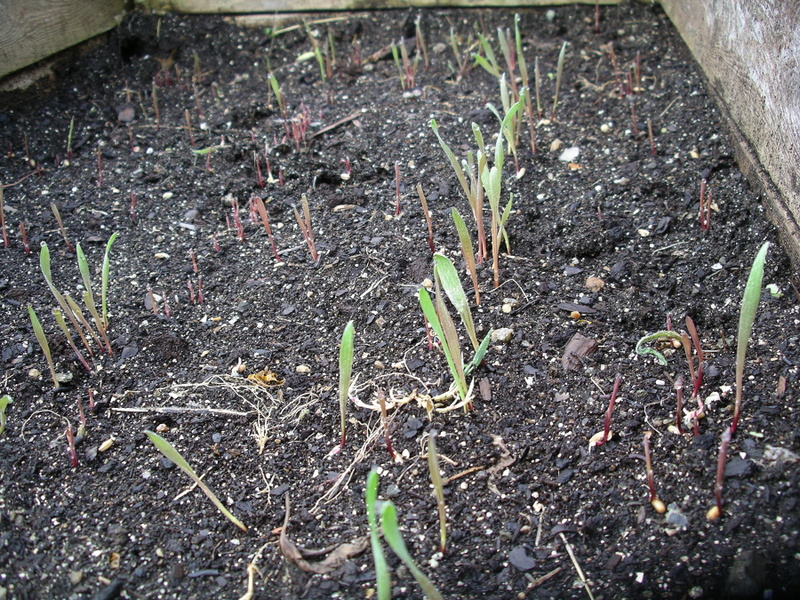 Anyway, the first week of October gave the plants plenty of time to establish themselves. Apparently, the seed will germinate even with nighttime temperatures approaching freezing. Gently cover the seed and let it grow. I am looking forward to seeing green in the garden beds this winter. Note that you may need to mow down the plants before tilling into the soil. Did you plant in an area where you will not garden next year? Then let the crop grow. Winter rye can grow up to 4 feet tall depending on variety, and you can harvest the plants for animal food or for mulch. I hope you have fun with cover crops this Winter. Enjoy.